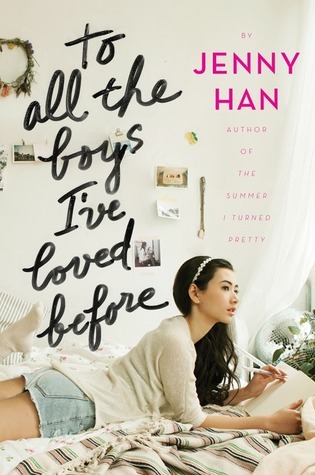 Book Summary: To All the Boys I’ve Loved Before is the story of Lara Jean, who has never openly admitted her crushes, but instead wrote each boy a letter about how she felt, sealed it, and hid it in a box under her bed. But one day Lara Jean discovers that somehow her secret box of letters has been mailed, causing all her crushes from her past to confront her about the letters: her first kiss, the boy from summer camp, even her sister’s ex-boyfriend, Josh. As she learns to deal with her past loves face to face, Lara Jean discovers that something good may come out of these letters after all. Looking forward to the sequel! I want it NOW!!! First of all, let me just say that TO ALL THE BOYS I’VE LOVED BEFORE by Jenny Han must be some kind of amazing to bring me back from the blogging dead. I took advantage of the e-book sale and bought a copy for $1.99. I don’t usually buy e-books (libraries, not piracy) but I’ve been putting off from reading this book way too long. Despite the great reviews from other fellow bloggers, I have to admit that I was still skeptical before picking up the book. As you may recall, I had a love/hate relationship with Jenny Han’s previous series. Much to my surprise, TO ALL THE BOYS I’VE LOVED BEFORE by Jenny Han completely blew me away. After reading so many Jenny Han books, this is the first book that I’ve really, really enjoyed. I took an immediate liking to the Song girls. I think this is mostly because I also come from a family of three sisters (and a brother…), and I saw a lot of similarities between them and my sisters. I am definitely most like Margot: the oldest sister usually responsible for taking care of the others. My middle sister is most like Lara Jean, and my youngest sister is also like the baby Song girl, Kitty. I found it very amusing to compare my sisters to the Song sisters. I really loved that family was such an important theme in the novel. Lara Jean is a very relatable protagonist – and I’m not saying that just because I also happen to share her fondness for letter-writing and old things. I really enjoyed reading about her experiences as she faces all of her past loves face-to-face. Sure, there is a love triangle – borderline love square – in this book, but surprisingly, I didn’t have a problem with it. Usually, siblings fighting over a romantic interest is a deal-breaker for me. However, in ALL THE BOYS I’VE LOVED BEFORE, Jenny Han manages to create a perfectly believable scenario. Additionally, I would be very upset with a book that has such an abrupt ending, but with ALL THE BOYS I’VE LOVED BEFORE by Jenny Han, I just wanted more. The book lacks a proper resolution. Since I can tell where the ending had been going, it makes me even more eager for the sequel. It’s been a long time since I couldn’t put a book down, and I’m so happy to have read TO ALL THE BOYS I’VE LOVED BEFORE by Jenny Han. I almost forgot what it is like to read a really awesome book.